Spring-heeled Jack, the legendary bogeyman familiar to students of British folklore, has been invoked by news of an extraordinary experience with a road ghost in Surrey. Scott Martin and his family told the Surrey Comet they were confronted by a ‘dark figure with no features’ that vaulted over a dual carriageway and over a 15ft bank whilst on a taxi ride home late on Tuesday, 14 February. The experience left Scott, his wife and four-year-old son Sonny shocked whilst the taxi-driver ‘admitted he didn’t want to drive back alone’ along the Ewell bypass near Epsom afterwards. The Martin’s experience is of course a classic extraordinary experience with a ‘road ghost’ of the phantom jaywalker type. Other examples are the ‘phantom hitch-hiker’ at Blue Bell Hill in Kent and the infamous Stocksbridge by-pass ghost in South Yorkshire, described in see my paper here. However this part of Surrey is not, as far as I’m aware, associated with a haunting tradition of this type, nor have the police received other reports of ‘unusual incidents or sightings in the area at night’. It will be interesting to see if publication of this report produces a rash of similar phantom jaywalker accounts. 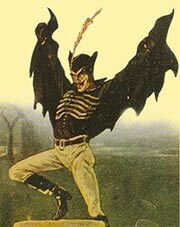 As for Spring-heeled Jack, the newspaper account says ‘the family has since likened the figure to the legendary figure reported to be responsible for a string of attacks in the 1800s and known for his ability to leap great heights.’ After a brief summary of the SHJ legend it adds that the last ‘sighting’ was in Birmingham in 1986! But as recent research into the Victorian newspaper archives has made clear, there was no one identifiable person called ‘Spring-heeled Jack’. Rather he was a frightening figure, an archetype: ‘part ghost, part bogeyman, part mystery assailant’, whose name and disguise was adopted by a range of human imitators in the century that followed his reign of terror in Victorian London. As this Surrey story shows, the leaping legend continues to live on in the collective memory 175 years after his name was first uttered…. This entry was posted in Uncategorized and tagged Blue Bell Hill, Ewell bypass, folklore, phantom hitch-hikers, phantom jaywalker, road ghosts, spring-heeled jack, Stocksbridge bypass, Surrey Comet. Bookmark the permalink. 19 Responses to Return of Spring-heeled Jack? It did make me wonder if this wasn’t someone who was dashing home to buy flowers and chocolates for someone – if so he should be a contender for the Olympic team! I have recently written and drawn a Graphic Novel that is available on Kindle, all about Spring Heeled Jack and it’s worth a read. Hi Craig, thanks for your email – can you supply the title and a link to the Kindle book? I would be happy to send you copies of my three Sheffield based Surreal Murder Mystery Graphic Novels on CDRom, the format they are sale in at Space Centre, Galaxy 4 and Rare and Racey. That’s Spring Heeled Jack, Meadowhell and Football Crazy. Thanks Tony – please keep sending over any new information on SHJ and related phenomena. If the phantom hitch-hiker/jaywalker tradition has any supernatural basis to it, then I suggest it is a result of faery tricks on humans for destroying their habitat. Take Bluebell Hill. It may well formerly have been a lovely area deserving of this name, but in reality today it is a horrible main road. If you were faery, you’d probably be upset at this man-made change. And i’m satisfied reading your article. But want to statement on few basic issues, The website taste is wonderful, the articles is actually excellent : D. Good job, cheers Check out my website to get more info about forex, if you like. I had a quick look on Google Streetview of the road mentioned in the newspaper report. While there are bushes, hedges and trees, there doesn’t appear to be any bank on the side of the road. I guess that leaves the story as someone crossing a road late at night quite quickly and then jumping over or through a hedge or bush. I’m sorry to rain on your parade here but there is indeed a bank on the A24 by pass if you follow the bypass past castle ave on your right you have swell castle school shown on the left with a body of water! A touch further up is an unnamed slip road and opposite on google maps is a square green area if you street view the road between the slip road on the left and green on the right you will find your steep bank I think the article mentions. I will also note that there is indeed a steep bank on several areas of the bypass…although I am inclined to think it was somebody out late at night and not wanting to be seen…a ne`er do well,perhaps…however,I wasn`t present in the car and it has to be said that most people are capable of knowing what they see…in this case it seems they saw something out of the ordinary ! Spring heeled jack is quite simply an djinn. I saw this thing you are describing when I was 12 or 13 years old. Me and my sister went out into my backyard and I saw this thing that I literally thought was the ghost of Abraham Lincoln, because he was wearing a top hat and had a cape plus he was really tall and skinny. I remember him looking at my sister then looking at me with bright red eyes, then he ran away quickly and jumped over our 8 foot fence like it was nothing. As if hopping over a small puddle. Me and my sister ran inside screaming and my parents and other siblings remember the description of what we saw to this day because of how descriptive we were and how scared we were. Everuthing i have read matches up to what i saw, but The only different is that the sighting was during the day. My sister said she saw the same exact figure a few years later wearing the same exact clothing running through the streets at a ridiculously fast speed. Thanks for posting your account – it’s fascinating. Where did this happen?